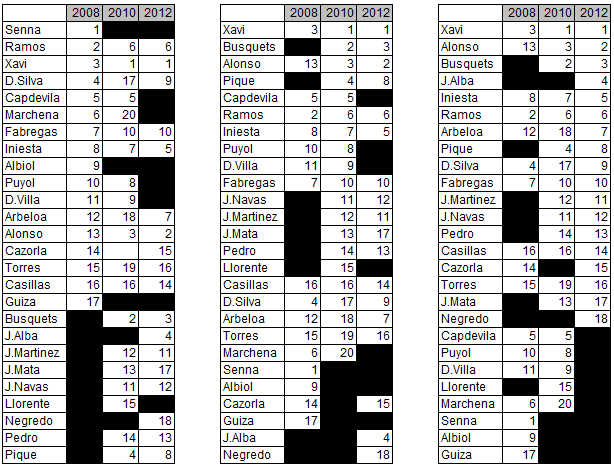 Below is the rank of importance among Spanish players in the EURO 2008, FIFA World Cup 2010, and EURO 2012. The rank is based on the number of touches in the game (i.e. the number of outgoing AND incoming passes of each player). The calculation is done in R, thanks to Tore Opsahl’s tnet package. Note: In the tnet package, the alpha that I used was 0.5. Some changes can be noticed clearly when the passing distribution in the 2 legs are compared. Here is the link to the first leg passing distribution. 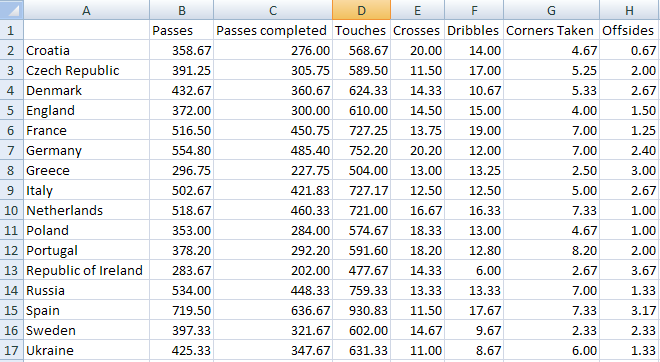 With David Villa playing rather than Fabregas, Messi could drop deeper and work more cohesively with Xavi and Iniesta. Moving Pedro to the left seems to be a fruitful decision too. First, Alves can work directly with Messi once again and at the same time Jordi Alba is “forced” to be more discipline defensively (i.e. doesn’t need to overlap very often as Pedro is already there). This impact can also be seen in AC Milan passing distribution in the two legs. See how Abate-Boateng thick link in the first leg is no longer present in the 2nd leg (replaced by Constant-Shaarawy link). Based on OPTA’s data (via footytube), below is the multidimensional scaling plot based on per game data of passes, passes completed, touches, crosses, dribbles, corners taken, and offsides. Multidimensional scaling (MDS) is a set of related statistical techniques often used in information visualization for exploring similarities or dissimilarities in data. Also known as Principal Coordinates Analysis, Torgerson Scaling or Torgerson–Gower scaling. Takes an input matrix giving dissimilarities between pairs of items and outputs a coordinate matrix whose configuration minimizes a loss function called strain. Based on the figure below, it is indicated that Germany and Netherland should have similarities, the same can be said with Ukraine, Czech, and Sweden. However, as far as my memory goes in watching the Euro 2012 games, I failed to notice how the teams are similar. In addition, what should be the label for the x and y dimensions? Note: The input matrix in this case is as shown below and can be downloaded here. I then used R to do the multidimensional scaling analysis. Didn’t watch the match, but have been reading how Toni Kroos played an important role in the match. 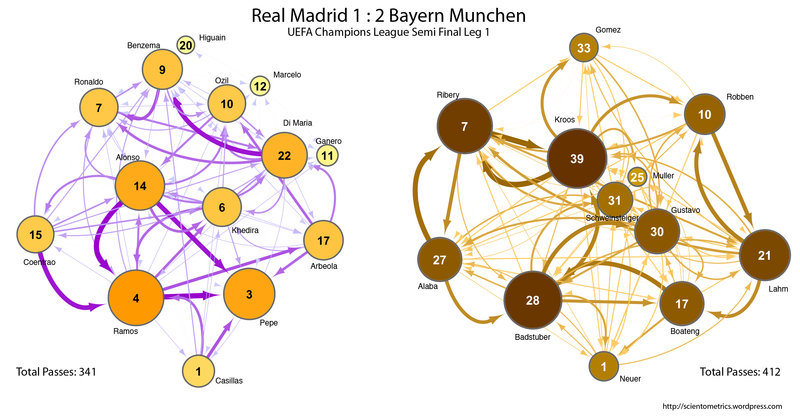 Based on the graph, he IS quiet central for Munchen in the match. Why were there so many passes by Alonso to both central defenders Ramos and Pepe? Centrao-Arbeola and Alaba-Lahm have similar passing distribution towards their central defenders (backward pass), but see how they differ in terms of forward passes. The number of passes by all Chelsea players: 194. The number of passes by all Barcelona players: 779 (Xavi alone completed 127 successful passes and received 133 passes!). Ball Possession: Chelsea 28% – 72% Barcelona. But, the most important fact is still Chelsea 1, Barcelona 0. Whole count: Each author receive a credit with a count of 1. Fractional count: Here, if a publication is authored by N number of authors, each author receive credit with a count of 1/N.